Suffer from IBS? A new study suggests meditation may help. Meditation is not a panacea for all ills but there is a growing body of evidence that shows it can help prevent stress, anxiety and depression, in some situations. But what about treat stress-related condictions? Bowel problems are an obvious area of potential benefit. Stress is likely to be a major factor in some bowel conditions. One of the consequences of the stress response system kicking in is a diversion of the body’s focus away from standard functions, such as the normal running of the bowels, in order to send energy to the muscles that will be required to run the flight or fight response. This is why marathon runners can experience upset stomachs. It is also why people is very stressful situations may pee themselves. So intuitively it makes sense that for bowel conditions in which stress is factor, then techniques that may have a stress-reducing benefit (such as meditation, Tai Chi or yoga) may have a role to play not just in preventing such complaints but also in helping relieve the symptoms. The latest piece of research is from a group in the US called the Benson-Henry Institute for Mind Body Medicine at the Massachusetts General Hospital (BHI). 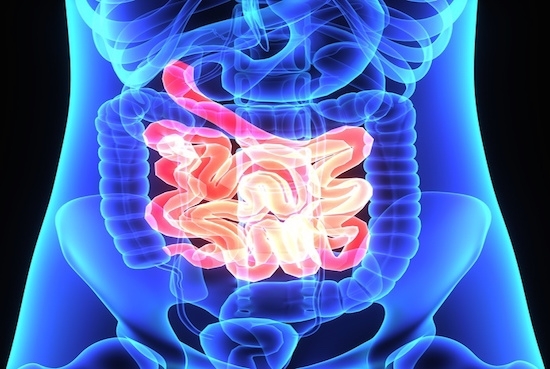 They have conducted a small study testing the impact of the ‘relaxation response’ on patients with inflammatory bowel conditions, namely irritable bowel syndrome and irritable bowel disorders (which can include serious conditions such as Crohn’s disease and ulcerative colitis). The study was not randomised or large enough (it involved only 48 participants), so its conclusions can only be taken as pointers. More research is required, on many more people, in a randomised clinical trial to prove these suggestions. Nonetheless, the results point to the possibility that activities such as meditation, yoga and Tai Chi, which can elicit a relaxation response in the body, may help not only make patients with IBS or IBD feel better about their quality of life but also actually improve the severity of the symptoms themselves. The study involved enrolling patients with pre-existing IBS or IBD in a 9-week course of 1.5 hour weekly classes. Participants were trained in concepts such as “including breath focus, single-pointed focus, imagery, contemplation, yoga, and mindful awareness); cognitive reappraisal skills, health enhancing behaviors, and the promotion of optimism and acceptance.” (Source). Collected through medically accepted disease-specific questionnaires, participants reported an average increase in their IBS quality of life of 20% by week 13 and a 16% reduction in IBS-related symptom severity between weeks 5 and 10. However, symptom severity then crept back up between weeks 10 and 13, although they remained, on average, better than at baseline. We can’t draw firm conclusions from this except to say there is enough here to suggest there may be something to it and more research is warranted (notably though results were better for IBS than for IBD). Of course, self-reported symptoms are not the best source of data from which to draw objective conclusions (which is part of the problem with all research into the impact of mindfulness meditation). But for those who want more tangible evidence it’s intriguing to note that the researchers also conducted blood and other tests to gauge how the intervention affected the expression of various genes in the participants’ body. The result is: a lot. I won’t pretend to understand exactly what the data means but if you want to see for yourself take a look here). “In both IBS and IBD, the pathway controlled by a protein called NF-κB emerged as one of those most significantly affected by the relaxation response…Indeed the relaxation response reduced the expression of a number of genes directly linked to the key inflammatory processes of IBD. It makes sense that techniques that can reduce stress should be able to help prevent the onset of some of these complaints. It will be even better news if they can also improve the symptoms once you’ve already developed it.